It’s sure feeling like Spring here in Vancouver!!! The warm weather inspired this beauty of a salad that I made for a plant-based potluck last night. It was a serious winner. 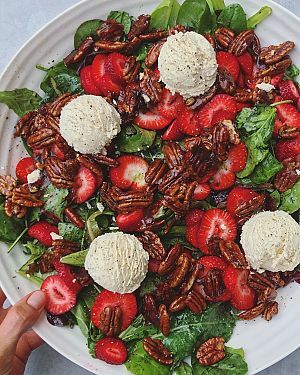 In the past, I might have considered this salad ‘basic’, but with tons of tofu feta, lots of crunchy candied pecans, extra strawberries and a killer dressing, it’s really delicious!!! The tofu feta recipe is from Virtuous Pie. Someone online very generously shared it with me after taking VP’s cooking class, and I don’t feel it’s right to share it. I can’t find another recipe like it online, but watch my pinned Insta-story of ‘tofu feta’ and you’ll get the jist. I’m sorry for the inconvenience!! I’ll update this post if it turns out I’m able to share. For the tofu feta – see my pinned Insta-story for ‘tofu feta’. Make this first as it needs time to firm up in the fridge. Candy your pecans: over medium heat, add brown sugar, cinnamon, salt and water to a small to medium pan on the stove. When it bubbles, add your pecans and cook for about three minutes (careful not to overcook – they burn pretty easily). When done, dump the mixture onto a sheet of parchment and, quickly, separate the pecans so they don’t stick together). Place in the fridge to firm up while you make the salad dressing. Salad dressing: add everything to a jar and shake to combine. Taste test and adjust if necessary. Build your salad: toss greens in a generous amount of dressing. 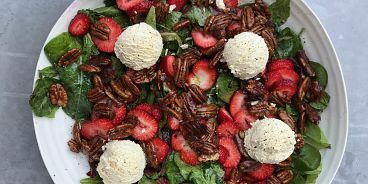 Add chopped strawberries, pecans (which you may have to separate if some have stuck together), and tofu feta (I used an ice cream scoop to form the feta balls, which I crumbled right before serving). Enjoy!! !